He Says Ari, She Says Arlo: Can You Help This Couple Agree on a Baby Name? Rebecca and Daniel are expecting their second child in about a month, a brother for their son Xavier, and are having a very difficult time agreeing on a name for him. When they chose Xavier’s name, it took them the entire pregnancy to decide on a list of six names, and they picked his name after he was born. At the moment, Rebecca’s choice for the baby’s name is Arlo, while Daniel’s is Ari. Rebecca doesn’t mind Ari, but finds it a bit nicknamey, and her cousin has a son with that name. Daniel thinks Arlo sounds good on a child, but won’t suit an adult. Rebecca has been passionate about baby names all her life, and has had a list of names picked out since she was about fourteen. Unfortunately, Daniel hates almost every name on that list, so their current list doesn’t really reflect her personal naming style. She would love a boy’s name that is strong and unusual, but not so obscure that nobody has ever heard of it. It’s also hard finding a name that goes with their surname, which sounds like Gibbon, but doesn’t start with G.
Rebecca hopes that people will be able to suggest some names that provide a middle ground between Ari and Arlo, and suit both she and Daniel. Although what she’d really like is a rock-solid case for using Arlo that will convince Daniel it’s the perfect name! I don’t have a rock-solid case, but I agree with you that Arlo is a great name, and would make a fantastic match with Xavier. It’s hip, spunky, cool, and to me, happy sounding. I think it’s possible Daniel finds it hard to visualise on an adult because it’s so much more common for children at the moment, so he thinks of it as a “little kid” name – the opposite problem to names like Mildred or Herbert, that we tend to think of as “old person” names, because we know so few younger people with those names. I think it was on Upswing Baby Names that I saw a tip from Angela about trying to visualise a name on different age groups (I can’t find the post now, so I apologise if I am getting this twisted in some way). I think she suggested using the Google Image search to look for real life examples of a particular name. When I Googled Arlo, I did find tons of children and babies, but also some adult Arlos. There’s soccer player Arlo White, skater Arlo Eisenberg, singer Arlo McKinley, this conservationist, this managing director with a PhD from Cambridge, this computer science PhD candidate at Berkeley, and this guy photographed with his fiancée. Having a good look at them, I think the name still suits them all as adults, and that the name fits them just as much as it does an Arlo in nappies, or an Arlo on his tricycle. But to be fair, I think Ari is an equally great name that would be an equally fantastic match with Xavier. I don’t think of it as a “nicknamey name” – I know Jewish people often use it as a short form of the Hebrew name Ariel, but it’s also a name in its own right in several different languages and cultures. And even as short for Ariel, I don’t think it’s “nicknamey” in a cutesy or child-like way. To me it seems strong and masculine, yet in an intelligent and romantic way, rather than a butch way. I wonder if the real problem for you is that it is the name of your cousins’s son? It may be hard for you to imagine on your own child because of that. While the easiest solution would be for one of you to magically change your minds, and say, Actually I now think Arlo is pretty perfect, or On further reflection, Ari would make a great name for our baby, if one of you isn’t keen on a name, sad to say, it can’t be the perfect name for you, no matter how much the other one loves it. Ari and Arlo are such similar-sounding names that you’d think the perfect way to meet in the middle would be with Archer or Arthur. But reading your email, I got a feeling of deja vu, because about 18 months ago, I wrote an article called She Says Clara, He Says Zara about a couple who were having problems agreeing on a name. In the end, they had a boy (named Lewis), but they did agree on a girls name, and although I can’t reveal it, it wasn’t Lara or Kara, but something completely different to either Clara or Zara, with a little of the feel of both those names in style. So I wonder whether it might be an idea to think of something completely different to both Ari and Arlo, but somewhat alike in style? From your name list, I couldn’t see much wrong with any of the names. The problem is that you say neither of you love the names, and that you can’t imagine them as your Xavier’s brother. That sounds like none of them are right for you. They might be right for another family named Gibbon, or perfect for someone else with a Xavier, but not for you. It seemed to me that Ari and Arlo are alike in more ways than just the initial sound: they are both cool and funky, boyish and smart sounding. They are both quite fashionable names, and they’re not in the Top 100 but not too far away from it either. 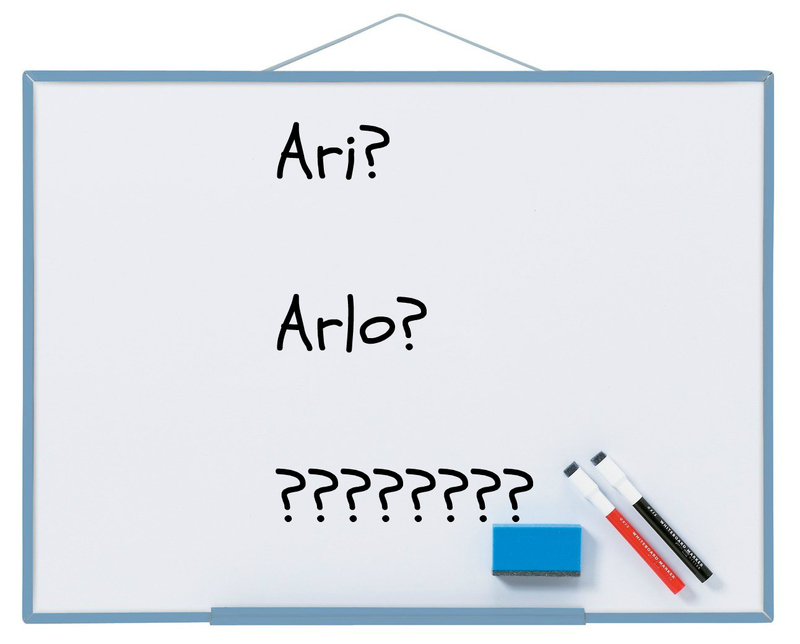 Even if none of these names are right either, perhaps they will help get the ball rolling in thinking of more names that don’t necessarily sound like Ari and Arlo, but have something in common with both of them. Good luck Rebecca and Daniel, and do feel free to write in again when you have a name list that you feel more enthusiastic about. UPDATE: The baby’s name was Elijah! POLL RESULT: Most people preferred the name Arlo, with 60% of the vote, and 25% preferring the name Ari. The remaining 15% liked both names equally. What about Levi or Elias? Elias comes with the cool nickname Eli too. Both sound great with Xavier! Love Arlo by the way and the suggestions of Miles and Jarvis. All the best! PS – I am so happy with our choice of Lewis, your help naming him was invaluable! How about using Arlo with Ari as a nickname for Arlo! Now that’s a very good solution to the problem, especially as Rebecca thinks Ari sounds more like a nickname.